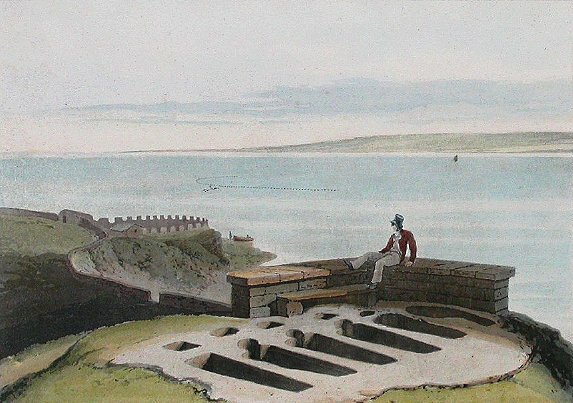 The strange austere watercolour of Heysham’s rock cut graves (right) is by William Daniell (1769-1837) a landscape painter and engraver. A framed copy of this is in the Heritage Centre. From 1813 to about 1823 he toured the coastline to provide images for his project A Voyage Round Great Britain published in 1825. The exact date of his visit to Heysham, is not known but it would be near the time of his contemporary J M W Turner’s visit (1816) to make sketches for his painting Heysham and Cumberland Mountains. The graves are Grade 1 listed and in the care of the National Trust. They also own the small stretch of cliff towards Half Moon Bay by the harbour. In 1977 and again in 1978 an extensive archaeological investigation of St Patrick’s Chapel and the graves was conducted by T W Potter and R D Andrews. Their investigations are recorded in great detail in The Antiquaries Journal 1994 Vol LXXIV. 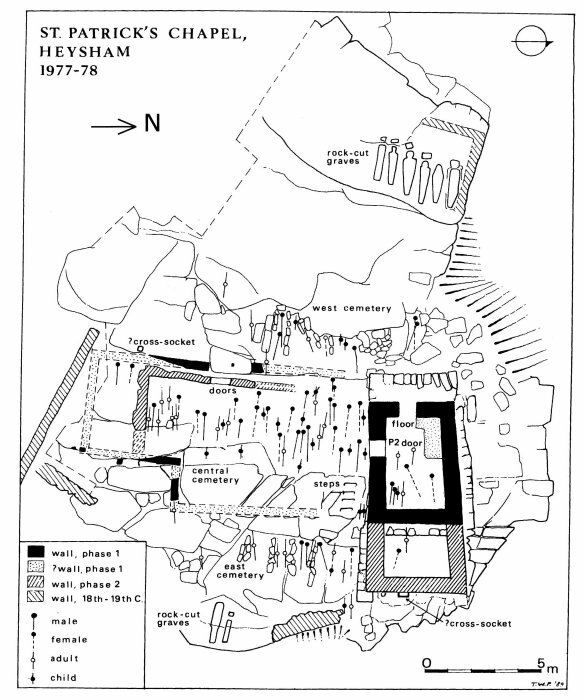 The diagram below is reproduced from that document; the group of rock graves pictured by Daniell can be seen near the top of the diagram.. Potter and Andrews also record that an earlier reference to the graves than the Daniell illustration is by Bishop Gastrell, in his Notitia Cestriensis, 1725. 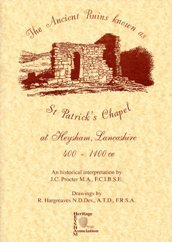 In 1851 John Robson described a visit to St Patrick’s Chapel in the Journal of the Historic Society of Lancashire and Cheshire. Click here to view it. 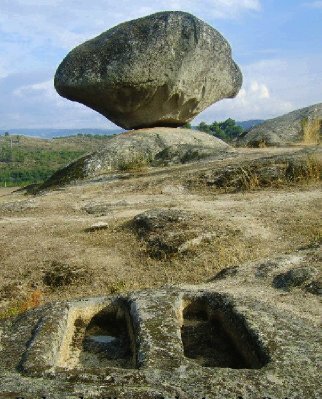 In Portugal there is are some similar rock cut graves at a well known site the Necropole de San Gens, consisting of around twenty rock-cut sepulchres surrounding the 'Pedra do Sino' - The 'Bell-Stone'. The picture below is reproduced from Ancient-Wisdom.co.uk with their permission. is a short but detailed account of the Chapel and Graves. On sale in the Centre or on-line.